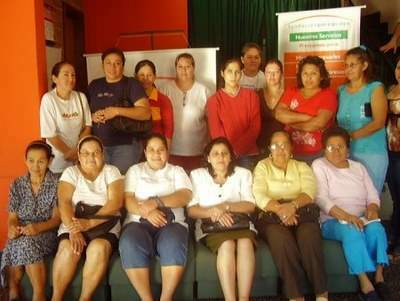 A micro-financing loan to the Oñondivepa Women's Group in Paraguay. This group was by Lucia Baez de Oviedo, who learned about the program via the members of the "Mujeres en Accion" ("Women in Action") group. The members of the Oñondivepa live in all in the same neighbourhood, Puerto Pabla, in the city of Lambare (Paraguay). Each of the members has in interesting story. For instance Basilia Lima de Maciel, who was widowed 5 years ago and has 4 children. They are already grown and married with children. Basilia is very involved in the community and visits the ill in the neighborhood, bringing them words of hope. She learned in a course how to embroider with thread, crochet style. She makes baby clothing, stockings, gloves, little shoes, hats for newborns, but also women's clothing such as blouses, skirts, dresses, shirts, etc. This loan goes through "Fundación Paraguaya", the local micro financing partner of Kiva. This is The Road's 9th social project. The funds for this loan were donated by the VK0IR Heard Island expedition team.